Leave the window blinds shut! Warning: This post is extremely honest! I have a dirty little secret. 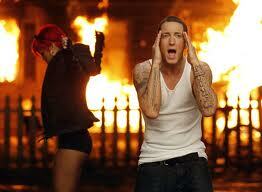 I love the new “Love the way you lie” song by eminem. Inside the lyrics there is a concept that pain is addicting. Depression, pain and suffering can become such an addicting companion that we have trouble letting them go. There is almost this sick pleasure of embracing them at some points. Really it seems crazy, but put simply put, it becomes an addiction. One way to combat depression is exercise, another is simply letting light into dark rooms. Sometimes you embrace depression so much that you find yourself purposely leaving the blinds shut to embrace the pain and agony, because it fills voids and gaps inside of you and it kind of feels good. Here are two quick observations, honestly I could probably manage to write a book someday, but this will have to do. One: we embrace pain and suffering because ultimately it gives us control. Sometimes when all feels lost and hopeless, circumstances become treacherous (abuse, disappointments, break-ups) there is no way to control what is happening, so we use our pain and our suffering as a means of power. Some pain and suffering is voluntary, and for the most part it is in our hands how we react to some situations. By embracing the pain and suffering and acting as though it is just a normal part of us and that we shouldn’t change, we take “false power” over the situation. It’s kind of like the kid who always gets told what to do, so he starts holding his bowel movements because it gives him a sense of control and power, after all he is the only one who has control over his bathroom habits. We embrace pain and suffering because it feeds our ego. My counselor gave me the book “It’s not about me” and after reading through it I finally understand what she was trying to tell me. Sometimes we embrace pain and suffering because it makes the world revolve around us. When I was depressed and hurt, my life became about how everyone was against me, everyone should be concerned and worried about me. There is a lot more I want to discuss on this topic, but I think I will break it down into segments. I welcome and encourage feedback. Thank you for reading!